There is actually a whole fleet of them and they have made it out of CA and have been spotted all across the country. Crazy, huh? Kinda scary but pretty cool! It would sure making smoking cigars while driving much easier! Wait i have a question if the car is speeding who gets the ticket, the passenger, or the owner? 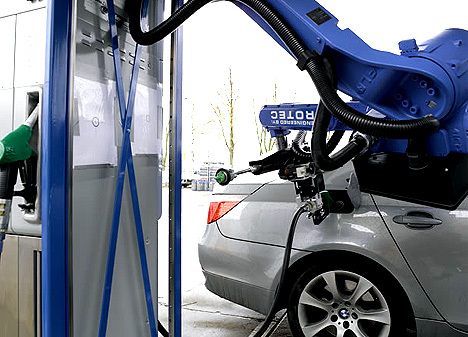 Robots are fueling cars too. While I think it's a cool concept. The alarmist in me wonders about legal ramifications when an accident does happen. Also, am I the only one who thinks this is not too far off from the people in Wall-E? Pretty cool, but it is a little scary when a minor breakdown or software crash could kill you and others. Cars have been working to drive them selves for years, through darpa's challenge. If I get one can i drink my $160,000.00 scotch while it drives me around??????? Way less likely than human error. Consider how a 747 can land itself. What's the point? Lazy @ss humans!! !